As we move forward ahead to 2019, we are excited to kick our Kids4Kids series with Disney’s Mary Poppins Jr. with performance dates February 1st – February 17th . Often time our productions are compared to the main stage productions. There our youth performers gain real-life experiences by working closely with top professionals from the areas. We are confident that our youth programming is a never ending revolving door of new experiences, helpful tools and guidance, educational mentorship, and where kids are encouraged to discover their own hidden potential. So rather you are a parent, friend, teacher, or want to get your name in lights, there is a place for you among our young programming. Welcome to the Kids4Kids Family Series Junior Productions. Our junior productions cast on average about sixty to sixty-five youth from the ages of six to seventeen years old. Auditions are usually held in November with rehearsals running from December to February. Our Kids4Kids Junior productions have been compared to EPAC’s main stage productions. 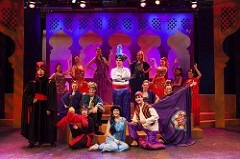 Here kids are exposed to intricate staging, vocal training, costumes, and elaborate lighting and set designs. Rehearsals are scheduled two nights a week with some weekend rehearsals. There are many opportunities for parents to be part of this experience by volunteering to assist in various capacities: ushering, concessions, costumes, parent ranger, cast party. Previous shows included Beauty and the Beast Jr, Annie Jr, The Wizard of Oz, The Little Mermaid Jr, and Aladdin Jr. We found that many of our young performers easily transition to main stage productions with confidence, with the fundamental tools to meet the expectation of being in a larger scale productions. We welcome those youth who would like to assist with the behind-the-scene mechanics, such as stage crew or spotlight operators. Whatever your strengths are, we will find a place for you. Our vastly popular Young Artist Cabaret Series has allowed our youth ages eight to seventeen to be part of an organic and less rigorous rehearsal process. Each performer is selected through auditions led by our Kids4Kids Series Director, Irving Gonzalez. Auditions are held in the fall. Various concepts and themes for the cabaret are developed in order to have songs specifically selected for each performer. Performers are not required to attend all rehearsals. Specific times and days will be scheduled; this is a one night event. Tickets can be purchased online or through the box office. Past cabaret themes have expanded from standard Broadway musicals to pop-rock and to our most recent cabaret entitled “At the Movies,” a revue of Hollywood classic films from stage to scene. Performers are exposed to singing in front of an audience and performing live with a three-piece band backing them up. A fun night for the entire family, this year’s performance is scheduled for Fri & Sat, Sept 20 & 21, 2019. We are thrilled to have Carly Ludwig and Brett Devlin as this year’s hosts at our third annual EPAC’s Got Talent. Both individuals begin their musical journey at EPAC performing in the popular Kids4Kids Junior Productions and Young Artist Cabarets. With their perfect balance of quick thinking and slapstick humor, we are confident our audiences are going to be entertained throughout the evening. EPAC’s Got Talent will feature young performers ranging from 6 to 18 years old. This is one-night event to be held on Saturday, May 18, at 7:30pm. EPAC’s Center Stage Summer Theater Camp returns for its twelfth year, giving campers entering grades 1-7 in the fall a chance to experience the theatrical process with a newly designed hands-on approach. EPAC’s Center Stage Summer Theater Camp is designed to inspire creativity, exercise the imagination, promote artistic confidence, and explore unique and exciting ways to tell enriching stories through the theater arts. Our professional staff will nurture individual talents in an environment rich with creative collaboration and team-building concepts. This program is designed to help the young creative mind both onstage and in the classroom environment.